"Software for download and exchange of files." 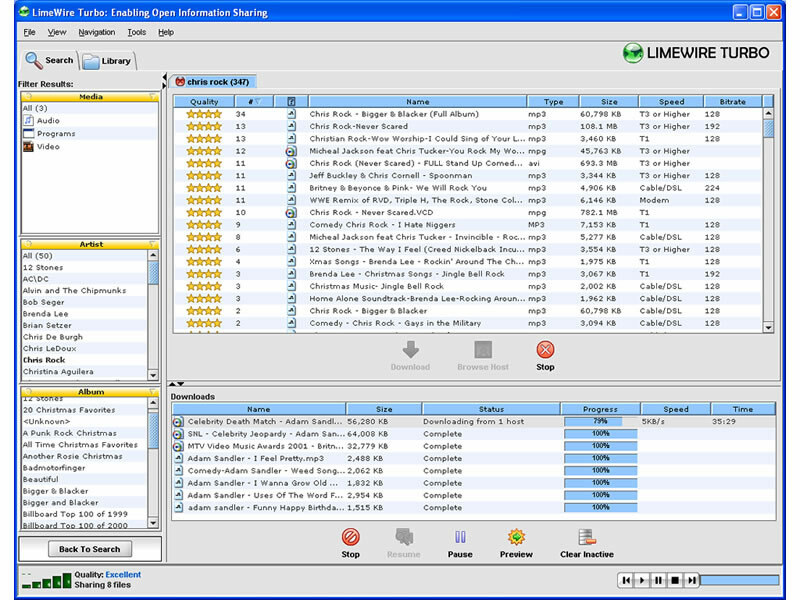 LimeWire is one of the many applications of this kind which serves for exchanging files peer to peer (p2p) using the Gnutella network. With LimeWire you can search, exchange and download files of any kind. It has the "ultrapeer" technology which reduces the requirements of the bandwidth, its interface is really easy to manage, and also it is a multilingual application, which is a point in its favor. In the end, it is a very similar programme to the famous Napster. Note that Java2TM Runtime Environment 1.3.1 is required. If you don't have it installed, LimeWire will do it automatically. The servers of LimeWire are disabled by court order, instead of them it is recommended to use other programs like, for example, Ares.